I always enjoy participating in Project Tuesday's projects, they are always fun and challenging, if you haven't found them hop on over and meet all the talented gals. I'm also participating for the first time in a challenge that I just found this week-Saturday Spotlight With Hidden Potential , I like these challenges that let you use all kinds of stamps and products because there are so many out there to love. Supplies: Kraft card stock: Marco's Paper, Creative Imaginations-heart paper, DCWV Christmas Glitter Mat Stack, Stamps: MSE!-Y590 Cupcake B-day, Clearly Wordsworth-V026 Tiny Wise Words, Ink: VersaMark Ink Pad, Ranger Archival Ink: Jet Black, Sakura Gelly Roll pen: Clear Star, Fiskars crimper, Stampin Up: Sizzlits Bold Cupcakes, Stampin Up: Word Window punch, ribbon: Offray. 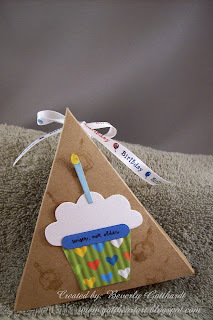 What an adorable birthday triangle box! Too cute! Oh, Lesley, I love that sweet little tree! Thanks so much for playing the Color Throwdown with us! How cute! Great to think outside the "box"! Thanks for playing CTD! This is so cute! I love way you combine challenges too. What an adorable little box! I love your interpretation of the CTD challenge! What a fun and inspirational post! Thanks for sharing your fabulous craftiness! Glad you enjoy the challenges Beverly, your triangle box looks fab! love your take on this week's PT challenge..that cupcake is scrumptious chickie! awesome! I love these little boxes and they're just great to 'dress up'. Love the cupcake you put on yours. Thanks for joining in with Daring Cardmakers this week. Darling box and design Beverely! LOVE the yummy cupcake, this would make a wonderful gift! Thanks for playing along with us over at Stamps and Smiles - Project Tuesday. What a clever idea! Thanks for sharing it with us at Saturday Spotlight!! What an adorable birthday triangle box!! Love the stamped background and your yummy cupcake. Thanks for playing with the Sat. Spotlight! This is fantastic! Love the cupcake - so cute!